Industrial production trends show output slowing across all three sectors in the chart of 12-month rates of growth. Sequential growth rates from 12-months and less (table) do not show a steady deceleration but do show a legacy of weakness. Over 12-months total IP less construction is up by a skinning 0.1%. All consumer categories of output show declines over 12-months. There is a 0.2% rises in the output of intermediate goods over 12-months. Capital goods carry the brunt of the load for growth with output up by 1.5% over 12-months. Over six months there are declines in all sectors of IP. The deepest decline is the 4.7% annual rate from for durable consumer goods output followed by the 4.5% drop for capital goods hot on its heels. Over three-months overall IP is lower and manufacturing IP is lower in both cases dragged down by the 1.5% decline in capital goods output. Ironically capital goods is the sector holding output up over 12-months but it is also the sector driving output to contact over three-months. Country level data show output declines in July for 5 of the 10 EMU countries in the table plus declines in two of three other reporting countries (UK and Sweden log declines while Norway posts a gain). 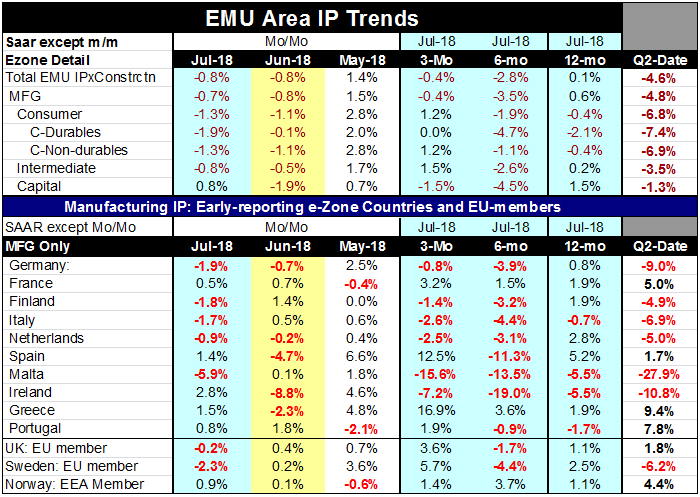 There were also five out of ten EMU member IP-reporting countries with output declines in June but only two in May. Output clearly has been in an irregular patch. Over three months output is falling in six-member countries, over six-months it is falling in eight of ten of them. Over 12-months output falls in four of ten EMU reporters. As between large and small counties in EMU France shows no IP declines over 12-months 6-months or three-months. Spain has a decline on only one of those horizons (6-months); Germany has declines over three-months and six months while Italy logs declines on all the horizons. On balance the IP data echo what we have been seeing in other recent reports and surveys on the European economy. Yesterday’s Zew survey showed a brighter assessment of current conditions than what output trends seem to paint here today. Zew showed a lot of concern for the outlook and at some point concerns about the future can and will affect the present.